You can make free video and voice calls to friends and family anywhere in the world from the comfort of your living room. If you want to call a friend who is not on Skype, you could make great savings by calling them on their landline or mobile using Skype. Make a broadband Internet connection. Press the HOME button, then select [Applications] at the bottom of the screen using the / buttons. Select [Skype] using the / buttons, then press the button. Select [Contacts] or [History] using the / buttons. Select [Contacts] to use your Skype contact list. Select [History] to use the call history list. Select the contact or phone number to call using the / buttons, then press the button. 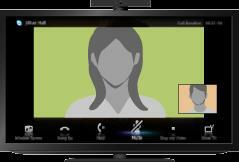 Select [Video Call] or [Voice Call] using the / buttons, then press the button. A status icon is displayed next to your contacts, so you know if they are available to have a conversation. Press the HOME button, then select [Applications] → [Skype] → [Tools] → [Call Phone Number]. Enter a phone number, then select [Call]. Search the Skype directory by entering the Skype name, full name or e-mail address of the person to call. Press the HOME button, select [Applications] → [Skype] → [Tools] → [Find Contacts]. Enter a Skype name, full name or e-mail address, select [Search], the Skype name/full name to call, then [Video Call]/[Voice Call]. After finding a contact from the Skype directory, select [Add to Contacts]. From the call history list, select the contact or phone number, then [Add to Contacts]. After entering a phone number, select [Save], then the desired option. Use the menu bar at the bottom of the screen. When the other party is displayed in full screen, you can show/hide the menu bar by pressing the DISPLAY button.